Harrisburg, PA – The controversial social network Gab, closely linked with white supremacist and fascist organizers since its launch, has drawn public scrutiny and had hosting difficulties since Robert Bowers, a prolific Gab user, shot and killed 11 people worshipping at a Jewish synagogue in Pittsburgh, PA on October 27. Before the shooting, Bowers also used his account to interact with many prominent figures in the neo-Nazi and “alt-right” hate movements that gravitate to Gab. Since then, Gab shifted to the domain registrar Epik, LLC, based in Bellevue, Washington, after its previous registrar cancelled services. Gab and its CEO, Andrew Torba, seem to still be dealing with legal troubles regarding the hate speech social media site, which could have implications for the company’s crowdfunding efforts. 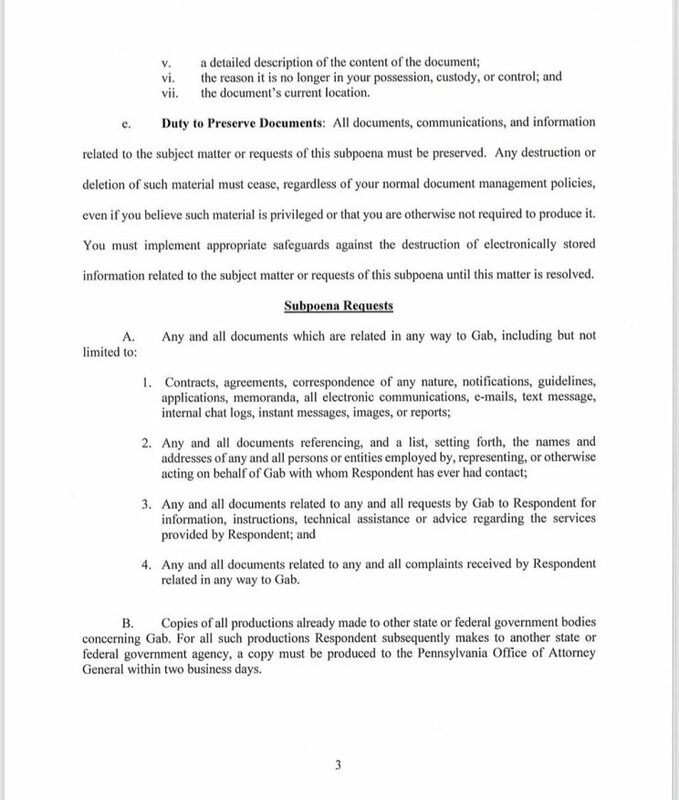 The Gab accounts, thought to be managed by proprietor Andrew Torba, boasted that they would defeat the subpoena, an order to collect and preserve all documents and material Epik might have about their Gab account. Torba previously claimed that he was cooperating with federal and state authorities in the aftermath of the Pittsburgh shooting, but a vow to beat the state authorities in court does not portend close cooperation. Within a few hours both social media accounts quietly deleted the posts, after tagging various right-leaning media like Fox News and the Drudge Report to try to get their attention. Before he deleted his comments, Torba falsely tried to frame the subpoena as a matter pertaining to Section 230 of the Communications Decency Act of 1996, which create a “safe harbor” of immunity for Internet publishers. 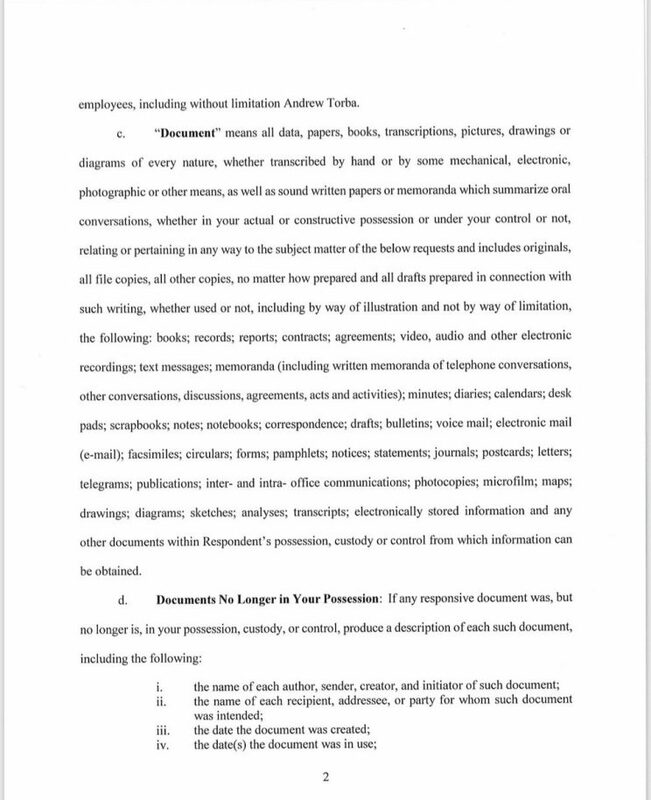 Already well-tested in US courts, Section 230 would likely help Torba defend against possible lawsuits for some types of content posted by Gab users, but this is totally irrelevant to the subpoena itself. The subpoena does not claim any facts about civil liability relevant to Section 230. By flippantly rejecting the subpoena, Torba may also have damaged his situation with crowdfunding investors, to whom he recently promised he would cooperate with authorities in solicitation materials noted below. Gab continues to use Cloudflare.com to function as its nameserver (NS) and Content Delivery Network (CDN), which masks the actual hosting company or companies delivering the main pages of the website. This can be verified by checking the “nslookup” IP address values for gab.com and asset servers such as ipr.gab.ai. The former Chief Technical Officer of Gab, Ekrem Büyükkaya, stepped down on October 28, 2018, announcing his immediate resignation on a Gab post. Two of three pages run by Gab on its crowdfunding site continue to publish false information asserting Gab’s main developer and tech lead are still part of the team. Gab continues to promote Büyükkaya on most pages at StartEngine.com. The original investor solicitation page at startengine.com/gab still lists Büyükkaya in the “Meet Our Team” section, a week and a half after he announced his resignation. Gab’s second crowdfunding page at startengine.com/gab-select claims “Gab AI, Inc. is currently in the Test the Waters Phase for Title IV investments.” This page falsely promotes Büyükkaya as a current team member. It asserts more than 1800 reservations of more than $5.6 million worth of blockchain tokens in a “Regulation A+ STO (Security Token Offering)”. This page’s most recent update, complaining about exclusion from the Google Play Store, was posted 29 days ago. There is no indication this page has become dormant or archived since then. Providing inaccurate information to investors, such as failing to document Büyükkaya’s resignation, on two crowdfunding pages, could attract further legal scrutiny. Gab’s third, more up to date solicitation page, at startengine.com/freespeech, reads “Gab AI is a Title III – Regulation Crowdfunding Campaign and is actively accepting investments.” This page discloses that former CTO Büyükkaya stepped down in an update posted a week ago. This page offers Gab tokens on the Ethereum blockchain at $4/share as Class B Non-Voting Common Stock, which has no influence over company management. The new offering also falsely claims “no doxing or sharing of private information,” and “no threads of violence or promotion of terrorism,” will be tolerated. However, when Gab’s site resumed operations on its new host, plenty of new posts appeared calling for genocide and murder, as well as death threats and messages celebrating Pittsburgh shooter Robert Bowers. The new business address for Gab is listed as 700 N State Street, Clarks Summit, PA 18411. Not simply an information reference site, StartEngine.com is “a website owned by StartEngine Crowdfunding, Inc. and operated by StartEngine Crowdfunding and its wholly owned-subsidiary, StartEngine Capital, LLC” according to a disclosure on the footer. StartEngine Capital, LLC, is a “funding portal” registered with the Securities & Exchange Commission. Funding portals are “crowdfunding intermediaries” created in the “Jumpstart Our Business Startups (JOBS) Act” of 2012. Gab’s business address on file at the Securities and Exchange Commission is 1200 E PARMER LANE #130 AUSTIN TX 78753, at phone number 570-209-1622. That address is an apartment building called “Bexley at Tech Ridge“. 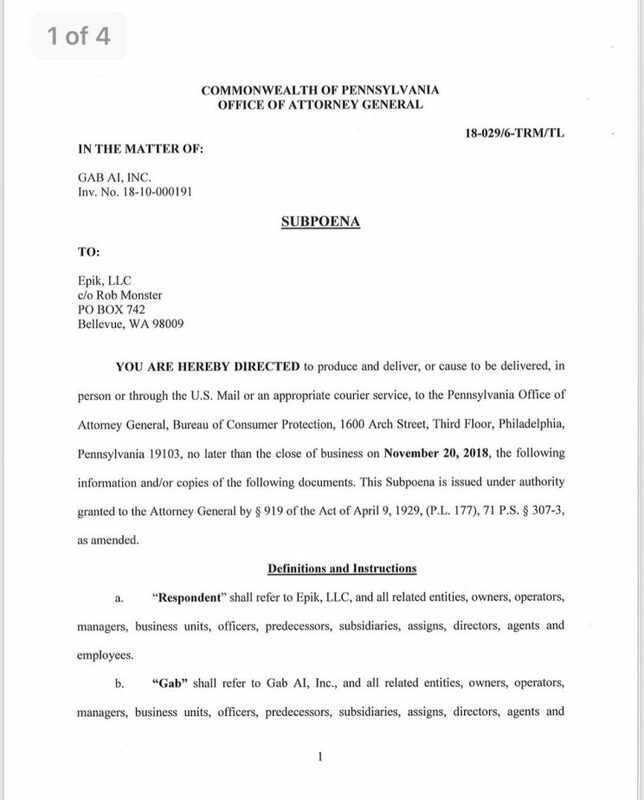 Business filing records in Pennsylvania list Gab AI, Inc as Entity Number 6599921, an active foreign corporation created August 30, 2017, registered in Delaware, with an address of “%AAAgent Services, LLC Dauphin”. Delaware corporate business records list GAB AI INC. as a domestic corporation, number 6146578, formed on September 9, 2016, registered to Corporation Service Company, 251 Little Falls Drive, Wilmington, DE, 19808, at phone number 302-636-5401. Unicorn Riot reported on October 30 about how Gab users leverage the Discord chat application to spread disinformation and bigoted material online. Click here to read leaked chat logs from the ‘Gabber Hangout’ Discord server.